I’ve covered this topic before on why a Flickr could be a tool your business uses. 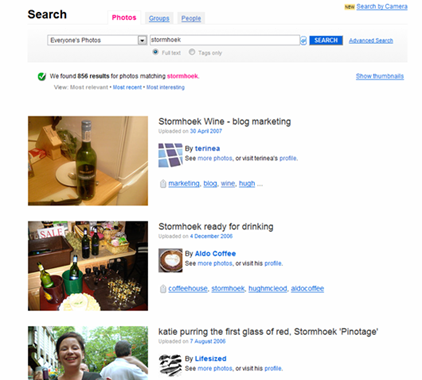 I’ve also covered the story of the Stormhoek wine and blogging before. So this morning I was pleased to see a link from Hugh MacLeod blog regarding pictures on Flickr tagged “Stormhoek” and to see a picture from the Terinea account on the first page. So what, big deal you may ask? Now imagine I’m a wine merchant, lets say Wine’s At 39 an independent wine shop round the corner from the office. 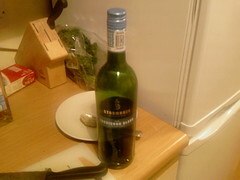 Having photo’s of wine I’ve automatically exposed my shop to people searching for wine, and hey it’s a small world, couple of them may live in Edinburgh. flicker.. ohhyeehh.. very good to share imagesss.